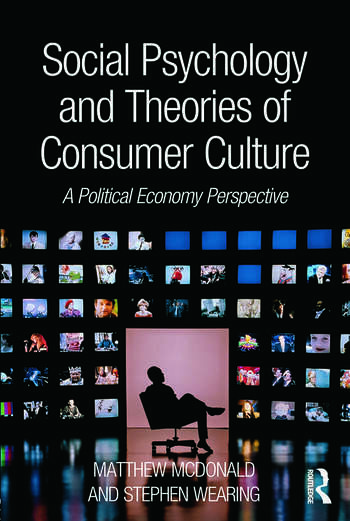 Social Psychology and Theories of Consumer Culture: A Political Economy Perspective presents a critical analysis of the leading positions in social psychology from the perspective of classical and contemporary theories of consumer culture. The analysis seeks to expand social psychological theory by focusing on the interface between modern western culture (consumer culture) and social behaviour. McDonald and Wearing argue that if social psychology is to play a meaningful role in solving some of society’s most pressing problems (e.g. global warming, obesity, addiction, alienation, and exclusion) then it needs to incorporate a more comprehensive understanding and analysis of consumer culture. Wide-ranging and challenging, the book offers a fresh insight into critical social psychology appropriate for upper undergraduate and postgraduate courses in personality, social psychology, critical and applied psychology. It will also appeal to those working in clinical, counselling, abnormal, and environmental psychology and anyone with an interest in the integration of social psychology and theories of consumer culture. Matthew McDonald is a visiting research fellow in the Graduate School of Psychology, Assumption University, Bangkok and a chartered member of the British Psychological Society. He is the author and co-author of a number of books, the most recent including Critical Social Psychology: An Introduction (2nd edition; with Brendan Gough and Marjella McFadden) and Epiphanies: An Existential Philosophical and Psychological Inquiry. Stephen Wearing is an associate professor in the Management Discipline Group at the University of Technology, Sydney. He is the author, co-author and editor of a number of books, including Tourist Cultures: Identity, Place and the Traveller (with Deborah Stevenson and Tamara Young) and Journeys of Discovery (with Kevin Lyons).